Gilles Marchand, Francoise Fabian, Sabrina Seyvecou, Yannick Renier, Catherine Mouchet, Francois Negret. Directed by Olivier Ducastel and Jacques Martineau. This is a particularly French film. 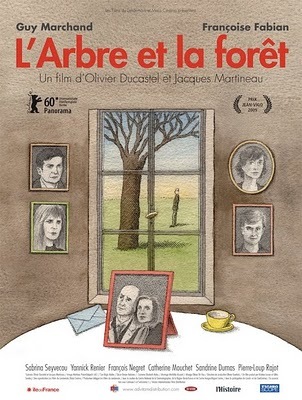 The French excel at making films about family gatherings, sketching characters and developing portraits as the characters talk and engage in conflict. There are usually meal sequences which offer opportunities for revelations. The occasion here is a funeral or, after the funeral. The father of the deceased (Guy Marchand) does not attend, which irks his surviving son and his dead son's daughter (Sabrina Seyvecou) who is there with her partner (Yannick Rennier). He seems a haughty man locked into his own life. His wife (Francoise Fabian) seems the strong, sometimes silent type. In the aftermath we learn the life story of the father which helps the audience and the family to understand him and, perhaps, sympathise with him. He reveals that he was a young homosexual amongst those rounded up by the Gestapo in 1941 and deported to a concentration camp. He suffered, felt his life was ruined but escaped in 1943. With mores more secretive in that era, he married, had two sons. His wife decided that they should stay together. The other character explored is the granddaughter, a fragile personality who relies on her supportive boyfriend. So much of the film is talk and discussion, emotional talk that demands and commands our attention, especially when the father does tell the family his story. As the film notes at the end, it was only in 2001 that the French government acknowledged the persecution and imprisonment of the homosexual minority in wartime France. 1.A French family drama, focus on characters, discussions, issues? 2.The estate, the home, the forest and the trees, the interiors? Appearances by Charles? 3.The use of Wagner’s music throughout, other classics? Frederick and his motives for playing Wagner in the morning, looking at the score? An anti-Nazi gesture? His wanting to be a conductor? The loudness and its effect of the family? 4.The opening, Frederick and the dog, his fear? His missing his son’s funeral, the attack by Guillaume? Guillaume and his drinking, outburst against his father? The criticisms of the other members of the family? The revelation that he had visited the camp? 5.Marianne, the matriarch, seen looking out the window, Frederick also seen so often looking out windows? Her coping, the funeral, the explanation to the various characters, the story told to Francoise? Her life, marriage, the children, coping with her husband’s sexuality? A strong woman? 6.Frederick and his outburst, the challenge of the family, Charles knowing his story? Telling his story, nineteen years old, homosexual, politically to the right, rounded up by the Gestapo, accused of being in the park, his giving the information? The effect of the concentration camp on his life? Eventually the gates being opened, freedom, his parents getting him out of the country? The request in 1981 to be cleared officially a deportee but the document not having a box to tick his particular situation? 7.Guillaume and his anger, considering his father’s neglect, his drinking, Elizabeth, the children? His need for money, his return visits, the meals? Asking his father for money? The issue of the contract, the land, his signing the contract? 8.Francoise, her marriage to Charles, her daughter? The divorce, her experience? The clashes with her daughter? Her daughter wanting to be listened to? 9.Delphine and Remy, the edge in their relationship, Wagner waking them? Delphine asking Remy to promise never to hurt her? Remy sharing conducting Wagner with Frederick? The issue of the contract, her not wanting the money, signing? 10.Charles and his appearances? His relationship with his mother? 11.Marianne, selling the land for her trip, her going to Antarctica, the photo, her return, her being willing to sell the property? 12.The title, the tree that Frederick contemplated, the forests surrounding the house, his planting the trees, his decision to sell? 13.The theme of homosexuality in France, prejudice, laws, the concentration camps and the SS, the late acknowledging of these crimes in 2001?